I'm so tired. I want to write but I have so little energy. I'm really sad the weekend's over. Because I remember that when I blogged every day in November it felt like time was going really slowly, I'm going to put something down here in an effort to try to slow down time and make it all seem a little less fleeting. This weekend, I put curtains up in Alex's room. This involved rehanging the curtain rod not once, but twice; making two trips to Lowe's for supplies; and, ultimately, being satisfied with mismatched hardware so as to avoid a third trip to Lowe's and having to take down the curtains a third time. This weekend, I ate dinner at Ikea. Not at the nice mid-store cafeteria, but at the mini-mart-esque food stand at the exit. But it's OK. Tutu and I had a nice time and actually got a lot done on the trip. This weekend, I went to my tax guy and got scolded for arriving 20 minutes late. I got sent home with a bunch of homework and still have a lot of work to do to get all the required info. This weekend, I had a lovely dinner at Rose's Cafe on Union Street (after the meeting with the tax guy). Tutu, Nick, Alex, Teddy, Tuffy, and I all sat outside under a warm heater. We drank wine, ate mozzarella di bufala, polenta, beets, and yummy desserts. I did not count Weight Watchers points. 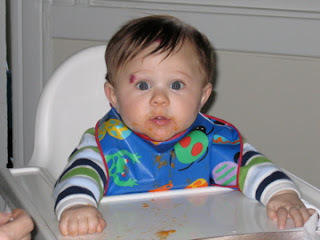 This weekend, I fed my 6-month-old mashed bananas, oatmeal, and sweet potatoes. He's so good in every way. He loves to eat! This weekend, I watered my plants. This weekend, I missed the Amazing Race because my TiVo messed up. I mean, seriously, how cute is that? He loves getting undressed for his nightly bath. Taking off his shirt is a guaranteed smile. I'll put up with a lot of BS in life for this little person. -Getting home one hour before your baby's bedtime. -Feeling constantly behind in every aspect of life. -Pumping for 1/2 an hour to yield a single ounce. -Knowing that feeling stressed about pumping isn't making pumping any more successful. -Getting into a groove at work only to realize you have to go pump unsuccessfully. -PG&E's broken bill pay system. -Wells Fargo's mysterious monthly charges that continually appear even though they're so not supposed to. -Prose blogging (takes too long). -Misogynists of any age (youth is not an excuse). -People who ride the elevator for one floor. -People who call to follow-up on emails. -But mostly just daylight savings.